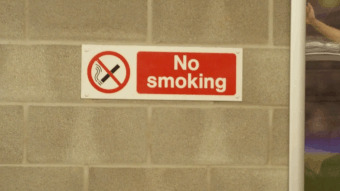 Our extensive range of no smoking signs from Label Source. Ensure that you comply with legislation on smoking by displaying these smoking prohibition signs where necessary. Legislation has created smoke free environments in enclosed and substantially enclosed buildings, on public transport (buses, trains, taxis and ferries) and in commercial transport such as heavy goods vehicles. These no smoking signs can reinforce this message in the workplace and public places. The no smoking guidelines are included in law, namely; The Smoke-free (Premises and Enforcement) Regulations 2006, and The Smoke-free (Exemptions and Vehicle) Regulations 2007 in England; Prohibition of Smoking in Certain Premises (Scotland) Regulations 2006; The Smoke Free Premises (Wales) Regulations 2007; and Smoking (Northern Ireland) Order 2006. All our no smoking signs comply with ISO EN 7010 and the Safety Signs and Signals Regulations 1996. Order your no smoking safety signs today! No smoking in this building symbol and text safety sign. No smoking, eating or drinking in this area symbol and text safety sign. No smoking, no eating or drinking symbol and text safety sign. No smoking or naked flames, Caution oxygen in use safety sign. No smoking symbol safety sign (England). No smoking safety sign (England). Thank you for not smoking label. No smoking symbol and text safety label. Smoking and naked flames prohibited symbol and text safety label. No smoking, eating or drinking in this area safety sign. Thank you for not smoking symbol and text safety sign. No smoking symbol and text safety sign. Smoking strictly prohibited symbol and text safety sign. No smoking beyond this point symbol and text safety sign. No smoking in this area symbol and text safety sign. Please do not smoke symbol and text safety sign. No smoking hazardous area symbol and text safety sign. No smoking, smoke detectors in operation symbol and text safety sign. No smoking in this office symbol and text safety sign. No smoking in the toilets symbol and text safety sign. You are entering a no smoking area symbol and text safety sign. Please extinguish before entering symbol and text safety sign. No smoking, no charging or discharging of vehicle tanks symbol and text safety sign. No smoking beyond this point safety sign. No smoking in this area safety sign. No smoking, smoke detectors in operation safety sign. Thank you for not smoking safety sign. Petroleum spirit highly flammable, No smoking, Switch off engine safety sign. Petroleum spirit highly flammable, No smoking, No naked lights safety sign. No smoking or naked flames, Danger risk of explosion safety sign. No smoking or naked flames, Petroleum spirit highly flammable safety sign. No smoking or naked flames, LPG highly flammable safety sign. No smoking or naked flames, Highly flammable material safety sign. No smoking symbol safety sign. Smoking and naked flames prohibited symbol and text safety sign. Smoking and naked flames prohibited safety sign. No smoking, mini safety sign. Smoking is permitted in this area, mini safety sign. No smoking text and symbol sign. No smoking beyond this point sign. No smoking beyond this point, Fire door keep shut sign. No smoking, Its against the law to smoke on these premises text and symbol sign. No smoking safety sign (England), English/Polish. No smoking of electronic cigarettes symbol and text safety sign. No smoking of electronic cigarettes in this building symbol and text safety sign.